Zen provide two methods of setting up IPv6. The first method is a simple DHCP method which should suffice most users, the second allows you to set up static IPv6 on both WAN and LAN. In either case the addresses and prefixes are constant and even under DHCP will not change. Currently Zen provide a /64 WAN address and a /48 prefix allocation. These will have been given to you by Zen when you request IPv6. Zen use PPPoE in the initial V4 connection, so enter PPPoE as the V4 connection type and set the username and password for the PPPoE connection, for IPv6 using DHCP, select DHCPv6 in the IPv6 connection as shown below. 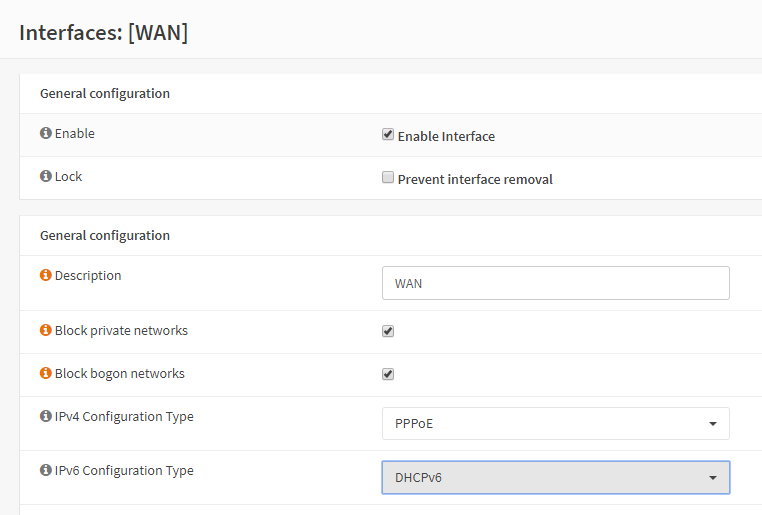 The next step is to configure the parameters required for DHCPv6, these are located in the DHCPv6 client configuration section of the WAN interface shown below. As stated before, Zen provide a /48 prefix, so select the prefix size accordingly. We directly send the solicit as in this case we do not wish to wait for an RA from the Zen gateway. 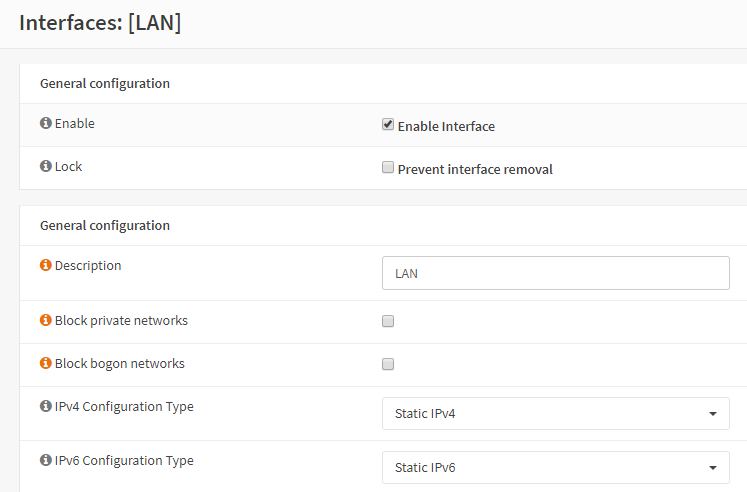 The only other requirement in this section is to select ‘Use IPv4 connectivity’, this is because the IPv6 traffic is routed over the PPPoE link. In the example above, ‘Enable debug’ is selected, this adds extra dhcp6c logging information to the DHCP logs, this is optional. Click ‘Save’ and then ‘Apply’. All that is required now is to set the LAN interface to use assigned IPv6 prefix. Finally, set the Track IPv6 Interface to WAN, unless there is a special requirement which this document does not cover, set the IPv6 Prefix ID to 0. It is advisable at this point to reboot the system. 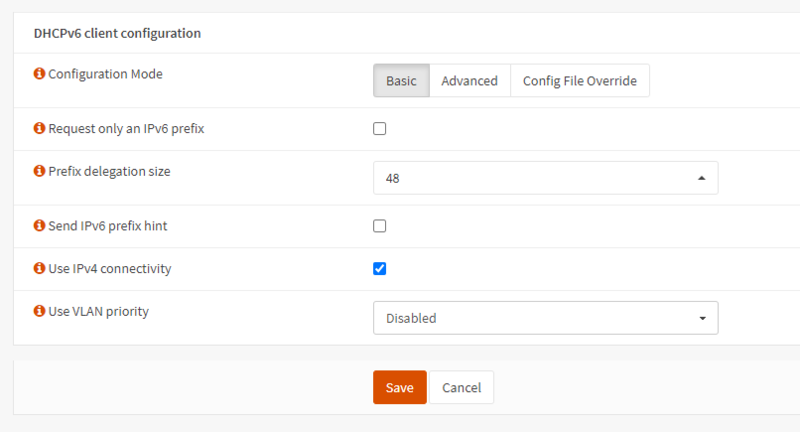 Although slightly more complex, this option gives you greater control over LAN DHCP6 server, as this can be tailored to specific needs. We can take advantage of the link-local that is automatically set up between our router and the Zen BNG, we do not need to know specific gateways at the Zen end, it all gets routed automagically, however we do need to set up all of our static assignments, and our DHCPv6/RADVD servers. Firstly, we do need to set up a gateway, this is for monitoring more than anything else. Select Gateways ‣ All then click ‘Add Gateway’. Now, we know that Zen give us a /64 on our WAN interface, for example. Pick an address, we’ll use ‘1’, so our WAN address 2a02:8231:d256:318::1, it’s also going to be our gateway. We will also add a target IP for our monitor, the target will be a global WAN address of something. You can use the Google v6 DNS server address if you wish. If no monitor is given the gateway address is used, which can check gateway health status but may or may not indicate access to the Internet. Once we have our gateway in place we can then set up the WAN interface. Select Interfaces ‣ [WAN]. Go to IPv6 Configuration Type and select Static IPv6. Tip Use the same address as found when setting the system up to use DHCPv6. Select Use IPv4 connectivity, all IPv6 traffic goes via the PPPoE link. Finally, select the IPv6 Upstream Gateway, this is the gateway you created earlier. The LAN interface is very simple to set up, all we need to do is set the IPv6 Configuration Type to Static, and enter our static address. We want to use a /64 prefix on this interface. When using DHCPv6 on the WAN, our DHCPv6 LAN server is set automatically, however when using statics, we need to set it up. Go to Services ‣ DHCPv6[LAN]. You will notice that the subnet already has a range, and the subnet mask is the /64 we set on the LAN. There is also a range we must use, the available range tells us what that can be. Enter the upper – end range that the server will use. This should cover most LAN subnets, the range given here gives 281,474.976.710,655 addresses. Our prefix range is the upper 48 bits, plus some of the next 16 bits, but we must not cross into the range we have used for our LAN addresses. In the example above I have allowed for up to 254 /64 subnets. Once these details have been entered, click save.